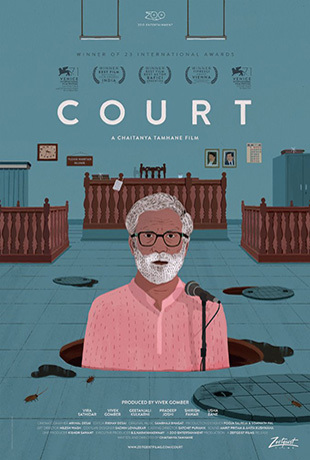 Winner of two major awards at the 2014 Venice Film Festival and India’s official entry for Best Foreign Film at the 2016 Oscars, 28-year-old Chaitanya Tamhane’s first feature, Court, is not a typical courtroom drama but a devastating look at the failings of the judicial system in India. Portrayed by mostly non-professional actors, the film is more than a court procedural, but also a look into the personal lives of the prosecuting and defense attorneys as well as the judge. What is revealed is not a condemnation of any particular individual but of well-meaning but powerless people trying to work within a corrupt system. Court, which underwent two cuts before being passed by censors, follows the case of Narayan Kamble (Vira Sathidar), a 65-year-old Marathi folk singer living in Mumbai, a political radical who has been arrested on a trumped-up charge of inciting a sewer worker to commit suicide after listening to one of Kambal’s songs, but Kambal’s lawyer, human rights activist Vinay Vora (Vivek Gomber, “The Letters”), believes there is almost no evidence linking the two events. The film opens as Kamble gets off a bus and walks through the Mumbai streets to a stage to deliver a powerful series of songs at a protest until uniformed police show up and arrest him. During each session public prosecutor, Nutan (Geetanjali Kulkarni, “Ragini MMS 2”) brings in stock witnesses who have been well-coached to point the finger at Kamble for breaking laws on the books since the 19th century and is supported by Judge Sadavarte (Pradeep Joshi), a traditionalist who enforces the full letter of the law whether or not it defies logic and common sense. Shot in long, wide takes, the hearings seem to drag on endlessly as a witness may fail to show up, or the police want to uncover more evidence, or other details that seem to be an excuse to deny the defendant bail and to keep him in jail. Tamhane increases the sense of realism by staying with a scene even after the main characters have departed, a sequence of events that demonstrate the endless parade of cases that a dehumanized system has to process each day. In one telling scene, a young woman’s case is refused to be heard because she is wearing a sleeveless dress. Vora, a member of a well-to-do middle-class family, is shown attending an upscale night club, shopping for expensive wine and cheese, then becoming extremely upset with his more traditional mother when she brings up the subject of his disinterest in marriage in front of a friend he has invited for lunch. He also pays the price of an offhand comment he made in court about the Goymari sect by being physically attacked outside of a restaurant. Nutan lives in a much different home environment. She is seen having a pleasant conversation with a fellow rider on the bus going home talking about how she cannot afford the money to buy good olive oil. We see her cooking for her husband and children and going to the theater with her husband to see a toxic comedy about the worthlessness of immigrants. During the day she ruthlessly prosecutes a case that has no merit, yet like the others she seems to go through the motions with little room for human empathy. Bored with seeing the same people every day, she says, “Sentence him to 20 years and let’s go onto something new.” Court does not hit you in the face with the message it wants to deliver, but is subtle and understated. There is an absolute lack of urgency or emotion in the court proceedings and, you might also say, little energy, yet it is a film that says a lot without appearing to. When we think Tamhane has said everything he is going to, he tacks on a telling coda about the judge’s summer vacation in a scene that sums up the film’s Kafkaesque absurdity.